Watching the ancient sport in Japan, I came to realise that size does NOT matter. The ground shook and I instinctively crouched under a doorway. A large blur thundered past, leaving behind a trail of admiring onlookers and a distinctive odor of baby powder. I was in the Aichi Prefectural Gymnasium in Nagoya, where I was hoping to get my first taste of sumo wrestling, and in that instant, many of my illusions about Japan’s national sport were shattered. 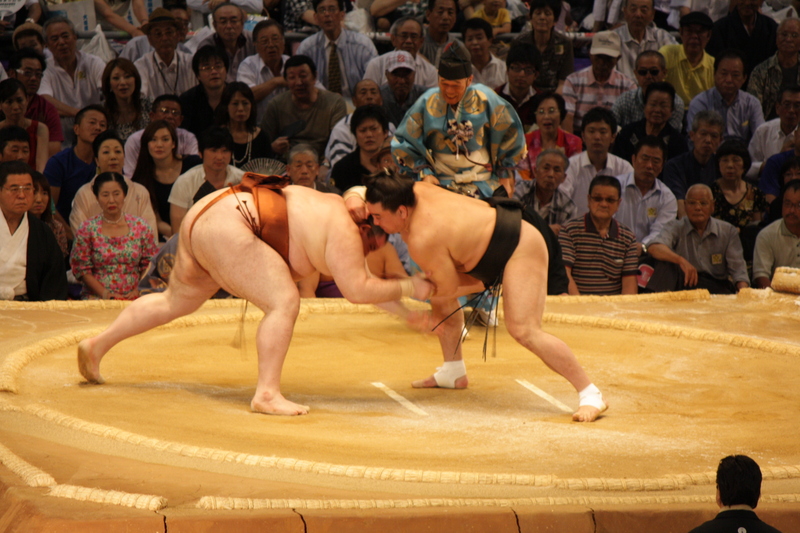 I realized that sumo wrestlers, despite their size and girth, happen to be incredibly fast. And, something that no amount of cultural immersion could have prepared me for, I learnt that sumo wrestlers smell of Johnson & Johnson’s baby powder. I was told later that it was a popular product amongst wrestlers as it staves off the discomfort from chafing limbs. As the day unfolded and I learned more about the sport, several other preconceptions were broken. Growing up, I was fed a steady diet of WWF and associate wrestling with carefully contrived drama and violence. 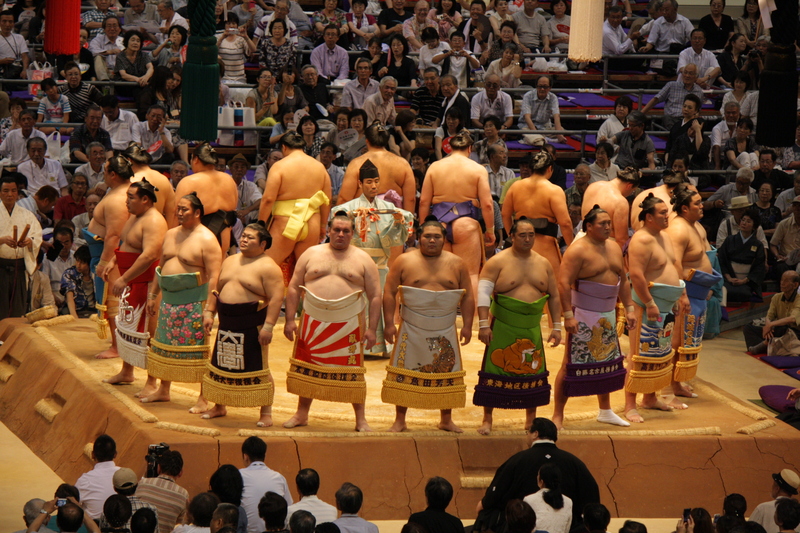 In many ways, sumo wrestling is similar – there are costumes and rituals and a show of brute strength. However, the sport is rooted in spirituality, and the pre-match rites lend an artistic touch to it, bringing an element of beauty and grace to what would’ve otherwise been an ugly duel. I entered the giant arena and took my designated seat, way up in the nosebleed section, where the tickets were the cheapest. Below me sprawled hundreds of premium seats – cushions and small tables laid out on the floor in traditional Japanese style. I had to squint a bit to focus on the very center of the stadium where, under an elaborate canopy, stood the smallest wrestling ring I had ever seen. With the spectators sitting right on the edge of the dohyo or mud ring, it looked too small to accommodate the enormous bodies that would soon inhabit it. The crowds buzzed around the packed stadium; punters placed bets, hawkers sold sumo memorabilia and children bartered trading cards of their favourite wrestlers. 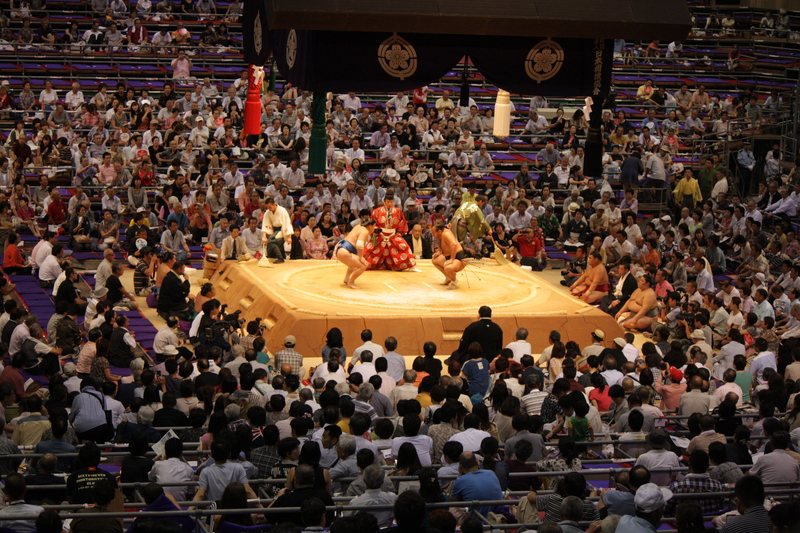 A hush fell over the stadium as the first of the rishiki (wrestler) entered the dohyo. 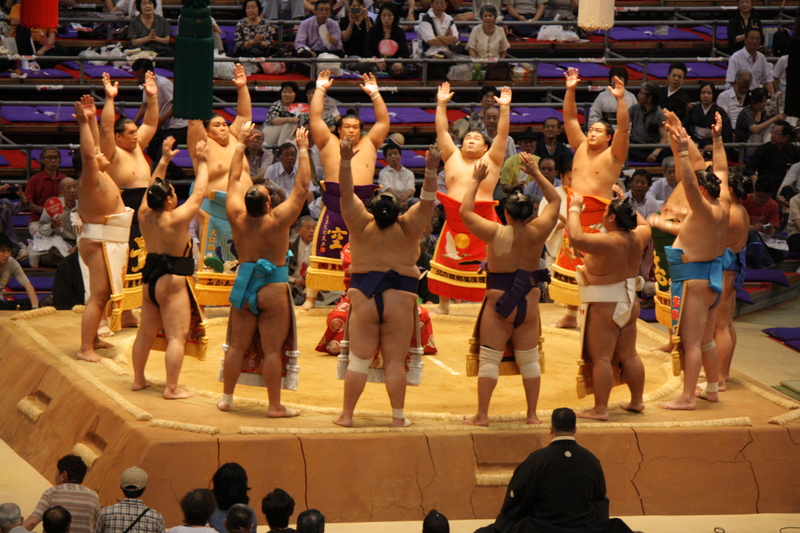 Dressed in colourful aprons, their topknots glistening under the lights, one by one each of the competitors walked inside the ring, taking part in a ceremonial ritual to pay homage to the Shinto gods. Steeped in tradition, the elaborate service continued into the fights themselves, as the opponents offered each other ladlefuls of water and scattered handfuls of salt in a show of respect and purity. Unlike the rituals, the matches themselves last a mere couple of minutes. 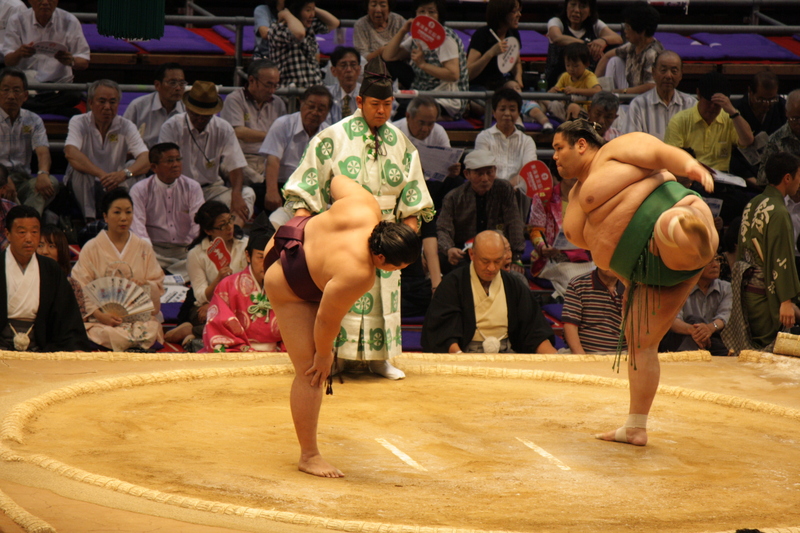 Once inside the ring, the two wrestlers face each other, stomp their weighty feet and slap their enormous thighs in a show of might. It is a fantastic sight to behold and the spectators roar in admiration as their vast bellies vibrate with each slap resounding across the stands. Circling, they swiftly, and deftly lock bodies, trying to grab each other’s loin cloths in an attempt to upend their rival. The wrestler who steps out of the ring first or touches the ground with anything other than the soles of his feet loses. After watching a few bouts, I quickly noticed not all wrestlers were obese. Nor were they all Japanese. There was a surprising number of Caucasian faces in the ring. 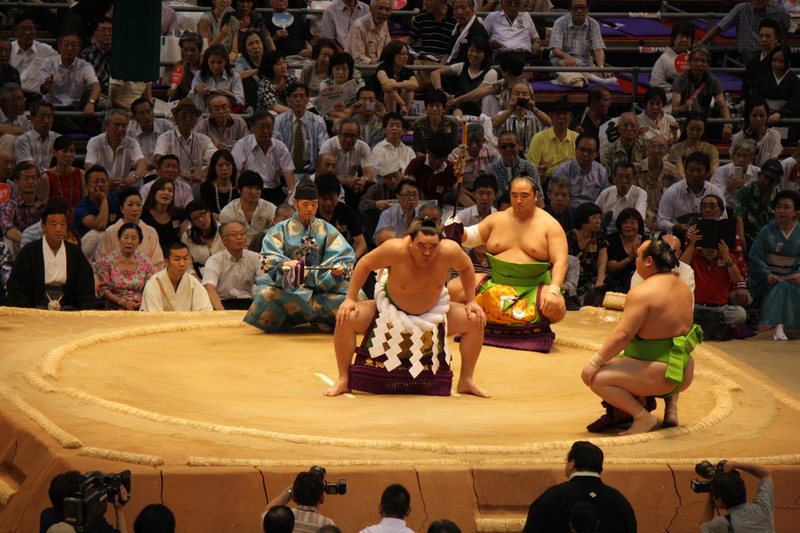 Sumo wrestling is quite the global sport. I also watched in amazement as comparatively diminutive wrestlers won round after round by using skill and dexterity to shove their opponents to the ground. As each of these mammoth humans came crashing down, I felt my seat shake and more than once I worried I was witnessing an infamous Japanese earthquake. This incredible spectacle, and the adrenaline rush, is best experienced by those in the coveted ringside seats; ridiculously expensive and patronized by the rich and famous. I watched in escalating alarm as an entire row of ringside spectators scrambled from their seats to avert being annihilated by a hundred and fifty kilos of flesh and bone that had just been flung at them. And in that instant, I was extremely thankful for my frugal nature that had prompted me to buy the cheapest tickets, far away from imminent danger.